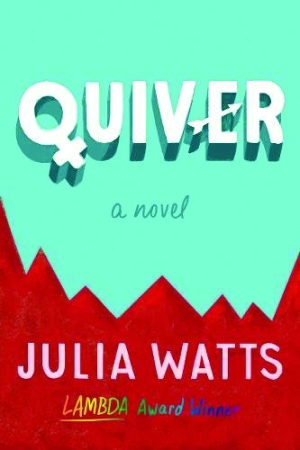 Quiver is a compelling story about an unlikely friendship between two teens from very different backgrounds. Libby—the eldest daughter of her family, whose life is filled with Bible study and helping care for her siblings—is lonely. When a new family with a child her age moves in next door, she is eager to start a new friendship. Zo’s family has relocated for a number of reasons—one of which is so that Zo, who is a gender-fluid teen, can work through the depression that developed when hir significant other tried to insist that Zo choose a single gender identity. Libby has her entire life planned for her—to question that is to question the will of God. Zo, in contrast, comes from a loving family that fully supports and accepts hir. Though their worldviews are a huge obstacle, Libby’s and Zo’s need for friendship compels them to try to get to know one another beyond their surface differences. The main characters in Quiver are wonderfully complex and relatable young people. Both defy the labels that society places on them. Their willingness to learn about and support one another is a beautiful example of the ways in which kindness and open-mindedness can lead to understanding. The book’s message of acceptance is clear from the first page to the last. Ultimately—though both families are trying to raise their children to be responsible, loving adults—Libby’s father is not willing to accept anything outside of his chosen belief system, and this proves to be a significant detriment to his family. Quiver is an amazing, heartfelt book with a powerful lesson to share. Nearly all young adults feel judged or excluded at some point in their lives; this story will help anyone, no matter their situation, see that acceptance is possible.